DJI's most advanced technology comes together in an easy to use, all-in-one flying platform that empowers you to create the unforgettable. Strong carbon fiber arms lift out of sight, transforming the way you shoot. 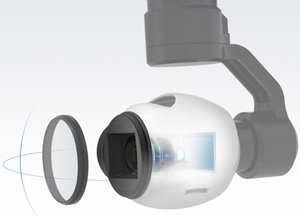 Get a full, unrestricted 360⁰ view of the world below and create images like never before. 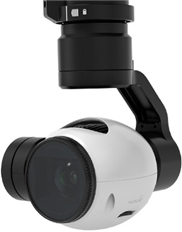 Shoot up to 4K video and capture 12 megapixel photos with the Inspire 1 camera. The lens consists of 9 separate elements, including an aspherical element, for extreme clarity, while Adobe DNG RAW support gives you the power to make every shot a masterpiece. 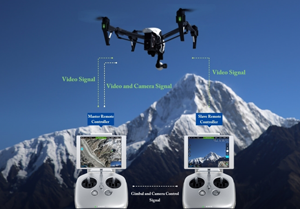 Take complete control of your camera and flight system with a comprehensive mobile app. Everything from manual camera controls to flight telemetry and even auto takeoff and landing are just a tap away, with more functions and updates coming soon. Change all of your camera settings, including ISO, White Balance, Exposure, and more on the fly ensuring every shot looks exactly the way you want. Takeoff and landing is easier than ever before, with both functions just a tap away. Tap once to takeoff and your Inspire 1 will hover and transform, ready to start filming. Then tap again to make it transform into landing mode and auto land. 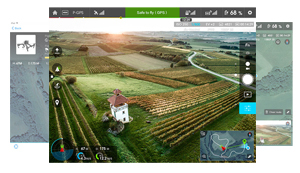 See precisely where your Inspire 1 is at all times on the live map. The map can be enlarged when needed and shows your most recent flight path. All of the information you need to fly safely is just a glance away. Altitude, flight speed, distance, and more are right at your fingertips. When GPS signal is available on the remote, the Home Point automatically refreshes. This becomes useful while traveling in a car or on a boat allowing the return-to-home point to move where the operator goes. Multiple configurations are available via the Dynamic Home Point function. Put yourself in charge by tailoring the Inspire 1's controls to your personal needs. This way, your Inspire 1 moves and responds in ways you're most comfortable with. Fly with a friend and share your vision. Achieve shots that never would have been possible alone by using two remote controllers. One person flies, while the other controls the camera. Flying indoors is easier than ever with Vision Positioning technology that provides accurate position holding even when GPS is unavailable. 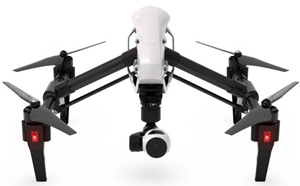 The sensors determine your Inspire 1's location and altitude and lower the legs automatically when landing. The Inspire 1's propulsion system is unique among all flight platforms. We re-engineered and re-built the system to handle the demands of advanced flight, while increasing efficiency and reliability. Inspire 1's gimbal and camera system can be removed from the aircraft for safe transport and future upgrades. Indoor flight has always been a true test of skill for all levels of pilots. DJI's new Vision Positioning technology uses a specially designed camera as well as sonic waves to bring simplicity to flying indoors. This technology allows the Inspire to hold its position, stop when the controls are released, and respond to your commands even when GPS is unavailable. A fully integrated intelligent battery powers your Inspire 1 and virtually manages itself. When in flight, your remaining battery power is shown live, letting you know how long you can continue to fly. Advanced algorithms calculate the distance of your aircraft and estimated time to return home, letting you know when it's time to fly back.